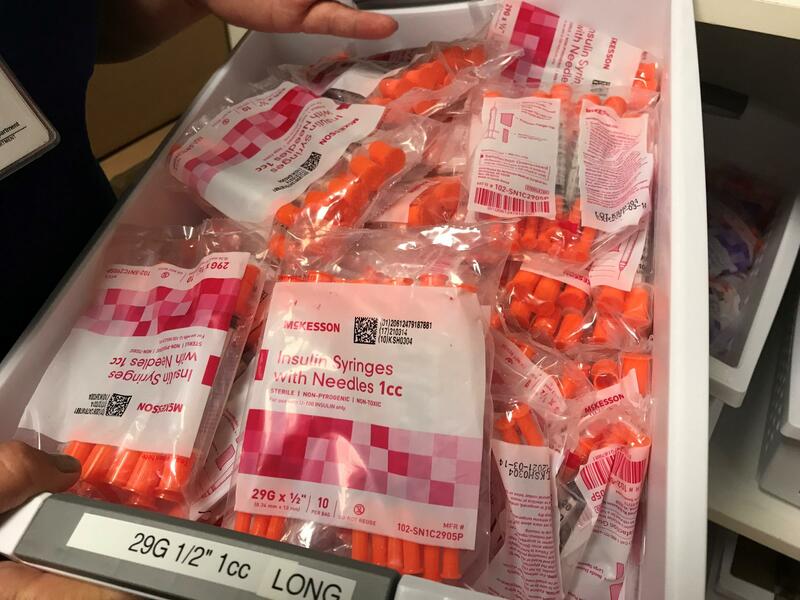 Angie Gray, Nurse Director for the Berkeley-Morgan County Health Department, shows a box of sealed, sterile syringes given to participants in her harm reduction program. Across West Virginia, people are fighting back against the opioid epidemic and pushing the message of recovery. Some of these people run harm reduction clinics – which sometimes include needle exchanges. We meet a nurse in the Eastern Panhandle who runs one of these programs. Angie Gray has known she has wanted to be a nurse since second grade. “I was one of those people [who] always knew what they needed to do,” she said, sitting inside the clinic she has worked at for 12 years in Martinsburg. Last year, Gray, who has been a nurse for 25 years and spent most of her professional career in Berkeley County, applied her passion for helping people to one of the most pressing challenges facing West Virginia: the opioid crisis. In April 2017, she started the county’s first harm reduction program with syringe, or needle exchange, access after seeing the devastation from the opioid epidemic in her community. Since the program began a little more than a year ago, it has ballooned in popularity from serving just a handful of participants the first couple months to more than 1,000 by the end of its first year. According to the West Virginia Department of Health and Human Resources, there are at least 11 harm reduction programs across the state that offer help to people with substance use disorders. Some of the programs have sparked intense controversy over the practice of giving free needles to people who use illegal drugs, including in West Virginia’s capital city. Despite concerns, advocates for these programs, like Gray, say they can be successful tools to help get more people into long term recovery. The focus of syringe exchange programs is to help prevent disease or death for people suffering from substance use disorder. Gray provides needle exchange and education about recovery, and it’s anonymous. The program never shares patients’ information. After Gray started her program, a handful of other Eastern Panhandle counties also began their own. A box of insulin syringes. Gray said she thinks her program has been successful, because she and her staff treat the patients like people and try to understand where each person is coming from when they use. “So, if they're using water out of a public restroom to mix their heroin with to inject into their vein, then that's where I go that day,” she explained. She doesn’t physically go there with them – but talks out the scenario in the exam room and explains cleaner ways to use if they aren’t ready for recovery. So, if the patient feels they have to use a public restroom to inject heroin, and they don’t have access to sterile water, she said they may take a less drastic measures such as removing the back of a toilet tank to access its water. “That water is cleaner and less potential bacteria in it, so it's reduction of harm,” she said. There’s a cap of 40 needles each week Gray and her staff are allowed to hand out. They also include a container for each person to return the dirty needles to the clinic. She teaches her patients how to clean used needles thoroughly until they can exchange for new ones. And some of her patients do enter recovery. More than 100 have reported back saying they entered recovery and are no longer using. Not everyone supports harm reduction programs with syringe access though. Some people think they only encourage substance use. A similar program in Charleston was suspended this past May by Charleston Mayor Danny Jones, over concerns the program was causing an uptick in dirty needles in public places. Gray is concerned her program could be shut down too, but said she works closely with local law enforcement to explain the benefits of the program. The Centers for Disease Control and Prevention reports harm reduction programs considerably reduce the spread of disease and do not increase illegal use of drugs. Gray said the program also offers a bridge to recovery. 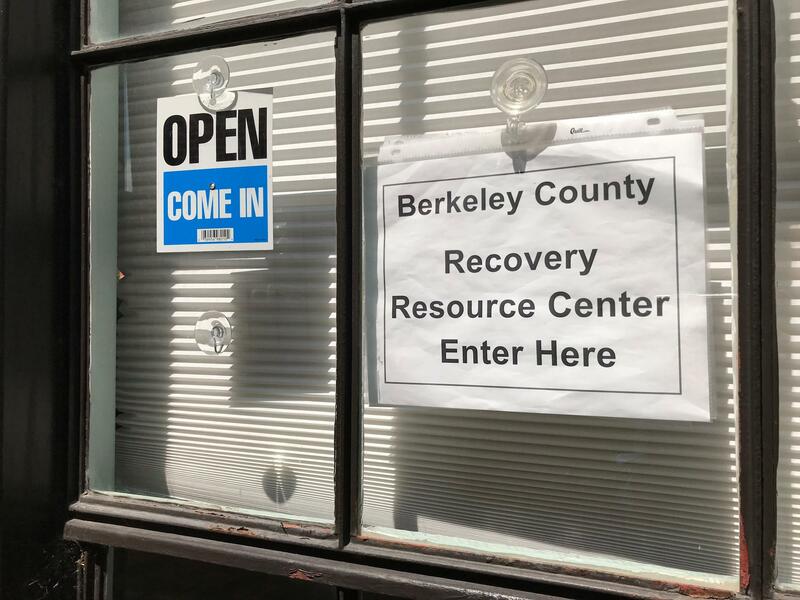 About two miles from Gray’s clinic is the Berkeley County Recovery Resource Center. Kevin Knowles is the community recovery service coordinator for Berkeley County and the President of the West Virginia Recovery Center Resource Association. Knowles works closely with several recovery initiatives in the county, like 12-step programs, detox and rehabilitation centers, and he works with Gray’s Harm Reduction Program. In fact, he’s helped all of Gray’s patients who decided they were ready to enter recovery. About three years ago, the Robert Wood Johnson Foundation recognized 25 public health nurses around the country who expressed great interest in becoming community health leaders. Nurse Angie Gray was one of them and received four weeks of special training in leadership and support in her harm reduction initiative. Gray was the only public health nurse from West Virginia to receive this training. Gray hopes the tools she’s learned and shared with her staff will foster more solutions to the opioid epidemic. Gray said her next move is to take her harm reduction program on the road, so she can meet the needs of more people in rural areas.